Looking for amazing things to do in Montmartre, Paris as recommended by a local? Read on for insider tips and secret spots most tourists don’t know about. As a criminally hopeless romantic, it should surprise no one that the Parisian neighbourhood of Montmartre is, in my mind, one of the dreamiest and loveliest places on Planet Earth. 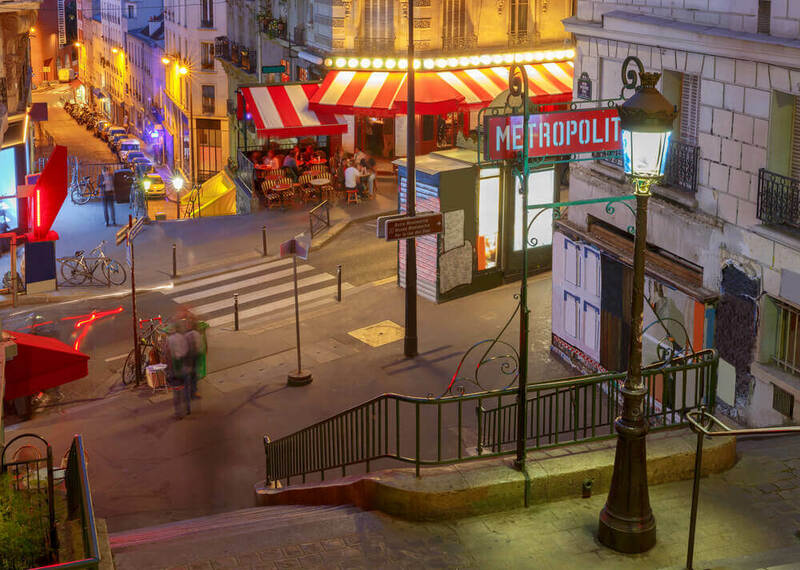 No doubt, Montmartre’s legacy as a hub for creative minds has left a halo of dreamy intrigue around it, resulting in growing popularity each and every year… sadly to the consequence of tourist traps, petty crime and throttling crowds. But we forget that Montmartre is still a neighbourhood where Parisians actually live… which means there’s an entire other side to the neighbourhood that most visitors never get to see. 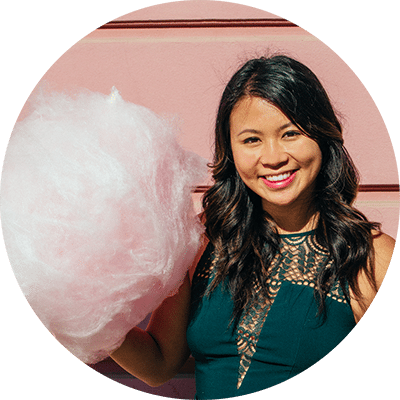 … Which is why I decided to kidnap a local and make him write this post with me. Guys, meet Roobens from Been Around the Globe, a Parisian who not only calls Montmartre home, but has been all around the world collecting the coolest adventures and memories. You can of course read more on his blog and Instagram, but I met him in Paris last year and can confirm: not only is he one of the friendliest guys ever, he is an excellent source of local info, which is why I’ve poached him for this detailed Montmartre guide. This piece of Paris is one of my all-time favourites, and it pains me when visitors get tourist trapped into missing the best things to do in Montmartre! 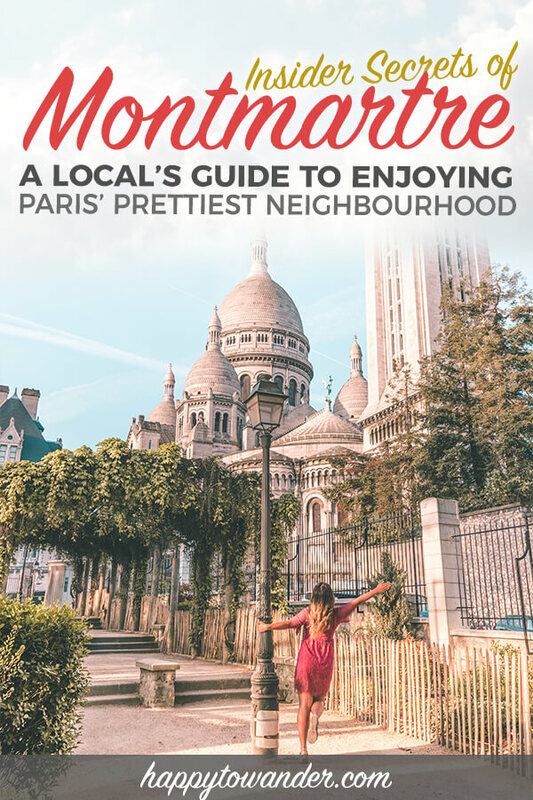 So, written with love alongside a local expert, here is a comprehensive guide to Montmartre that will tell you everything you need to know about making the most of your time here. After many repeat visits (and of course, tips from Roobens), this is a guide that you don’t want to miss. … Now rehearse those dreamy sighs and let’s get going! While my adoration level for Montmartre borders on “restraining order”, I can readily admit that it’s a part of Paris that can easily disappoint. The truth is, over the years, Montmartre has evolved from an offbeat artistic gem to a touristic madhouse, certainly in the summer. And while most articles about Montmartre continue to romanticize this lovely little neighbourhood, I would like to (surprisingly) tackle a more realist approach, because after all, if you’re clamouring after a magical, dreamy visit to Montmartre, the right expectations must first be established. So, I have to be annoying and break your heart with the following truths. 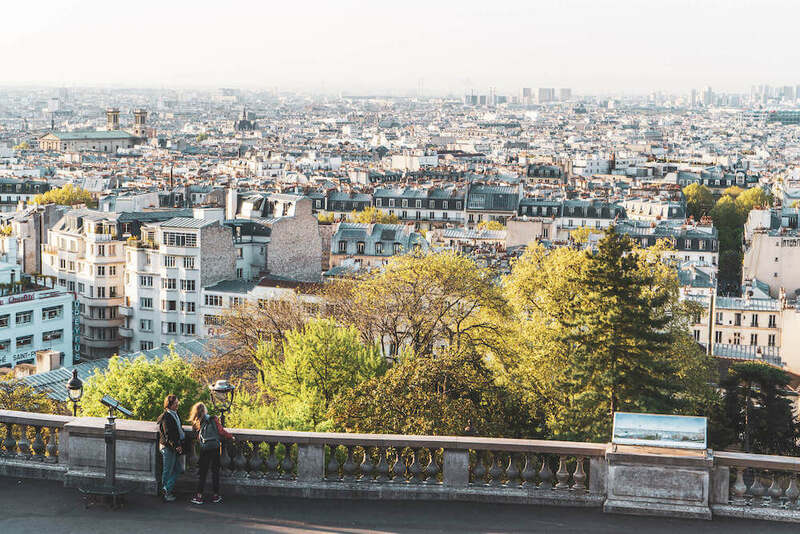 Montmartre is pretty much built on the highest point in Paris, and I know that sounds SUPER romantic, but the romance fizzles quickly when the searing Parisian sun combines with unexpected cardio sweat to create an exercise class you never asked for. So, remember: if your plan is to walk and explore Montmartre at your own pace (which is the best way to see Montmartre, honestly! ), plan accordingly by bringing comfy walking shoes and breathable clothes that can sustain uphill walks. Maybe bring your FitBit too so you can feel really good about yourself after. NOTE: If travelling with kiddos, train freaks or a burning desire to whizz smugly past sweaty tourists, there is a cute little white train that takes you around Montmartre. It’s called Le Petit Train de Montmartre and it’s actually free with a Paris Pass. Truthfully, during my first visit to Montmartre, I was disappointed. There I was, expecting an untapped gem of Parisian legacy, only to find myself sweltering among other camera-slinging tourists just like me, dodging keychain hawkers and aggressive restauranteurs eager to seat me for a “TYPICAL TOURIST MENU”. Frankly, it felt a little icky… and not at all what I expected. 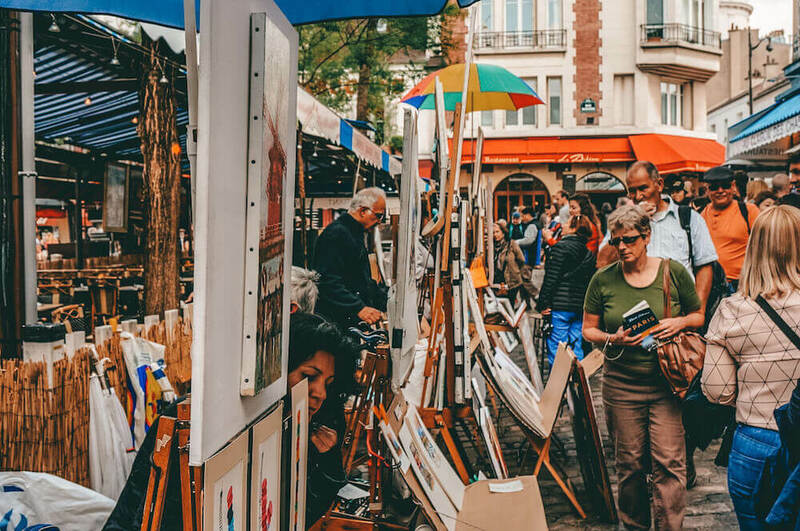 The sad truth is that Montmartre isn’t the artist haven it once was, and stepping through the most famous parts of the neighbourhood like Place du Tertre will yield endless crowds. 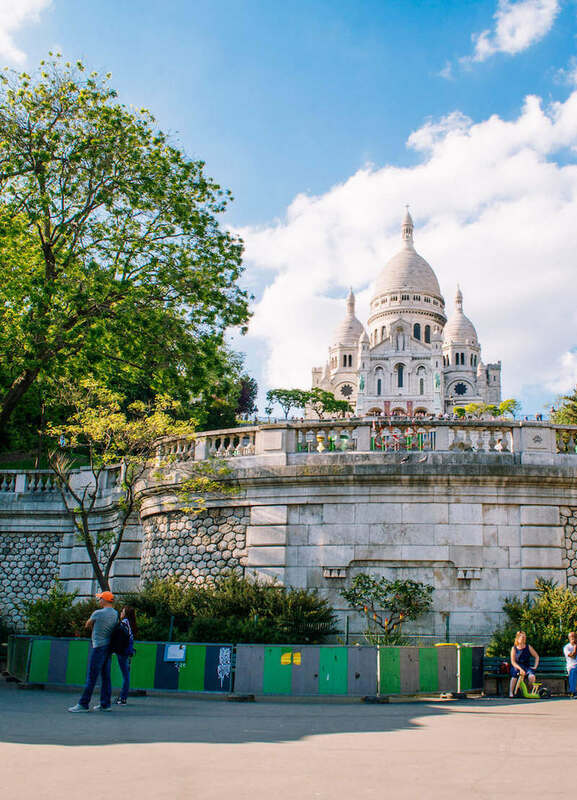 Montmartre is now, generally speaking, one of busiest tourist attractions in Paris, which means you most certainly won’t have the quiet, romantic experience you had in your head. 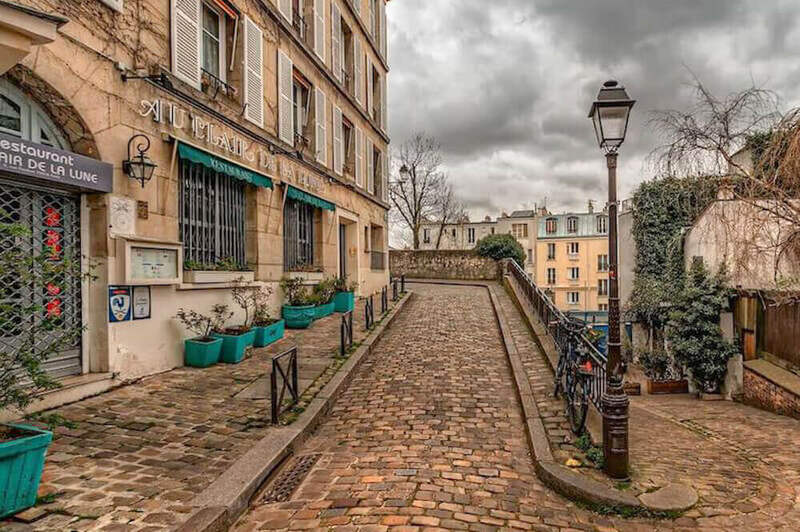 BUT, that said, if you visit early in the morning, go during the off-season or wander away from the typical tourist trail, you’ll still be able to recover that sense of charm that bring the masses to Montmartre. Don’t worry – this guide will help. Related to the above point, Montmartre has become such a famous destination for tourists that opportunist crime has sadly sprouted in equal measure. And while Montmartre doesn’t have a dangerous vibe by any means, there are many pickpockets and scammers lurking around, certainly in the Sacré-Coeur area. This shouldn’t deter you from visiting, but just be aware of your surroundings and vigilant with your bag, especially when there are crowds around. Usually pickpockets thrive on distraction (e.g. people bumping into you) so keep your hand over your valuables at all times. Le Fabuleux Destin d’Amélie Poulain is by far one of the most popular French films to have ever been released. Not only was it nominated for a gajillion awards, from a travel POV, it successfully put Montmartre on a glittering pedestal, as most of the film takes place there. And I promise you this: if you watch Amélie before your Montmartre visit, you will enjoy your visit a million times more. Seeing the filming locations play out in real life will give you a sense of nostalgia for a place you’ve never even visited… plus, accordion street performers have adopted the Amélie theme song as a key piece in their repertoires, which at times transports you straight into the film itself. Am I being too gooey and hopelessly romantic? Erm. *grunt* Let’s move on. 5. Bring a refillable water bottle! Last but not least, there are lots of drinking fountains with delicious free water (even sparkling water!) scattered around Paris, but given the hilly nature of Montmartre (see point #1), you’ll be needing those fountains especially in Montmartre. Click here for a map showing all the different water stations around the city. If I haven’t scared you off yet, here’s how you get to Montmartre! OPTION A: Take the Metro and get off at Anvers station (on line 2). When you leave the metro station, take the first street on your right, rue de Steinkerque. No worries, it’s impossible to get lost, the whole crowd is going to Montmartre. If you’re not sure, just follow the groups. Anyway, turn right, go up the rue de Steinkerque and voilà! You’ll be facing the Sacr- Cœur! OPTION B: Get off at Abbesses metro station (on line 12). When you leave the station, take the first street on your left, rue Yvonne le Tac. Walk over this street, and keep going straight. You’ll get to rue de Tardieu, and then Place Saint Pierre. After a few minutes, you’ll see the Sacré Cœur on your left! All right, now you’re in front of the Sacré Coeur but you still have to go all the way up to Montmartre! Again, you have two options. You can take the Funiculaire de Montmartre, a nice cable car, or you can climb the stairs to get there. NOTE: You have to use one metro ticket if you take the Funiculaire. Wondering what to do in Montmartre? The truth is, you could easily spend a full day, or several days here. For me, I could probably spend the rest of my life tumbling around Montmartre like a human cheese wheel, and STILL find new places to coo over. So what I’m saying is: there are a lot of wonderful things to do in Montmartre. Let’s start with some of the most “typical” things to do (i.e. touristy AF but still fun), then dive into a few more offbeat choices. On my first few visits to Paris, I always liked Montmartre, but truthfully, I never “got” it until I did a (free) walking tour of Montmartre with Discover Walks. It was on this tour that I got to learn the pieces of history and all the little stories, anecdotes and characters that make this neighbourhood such a special one. Trust me, Montmartre is infinitely more interesting when you get to hear the history of the place! That’s why I highly recommend booking a tour with a local guide at some point. A Polaroid Tour through Montmartre: This tour brings you through Montmartre with a local guide and a Polaroid camera, with 10 photos included so you can have some special mementos from the experience. It has rave reviews so far. Click here to check reviews and availability. 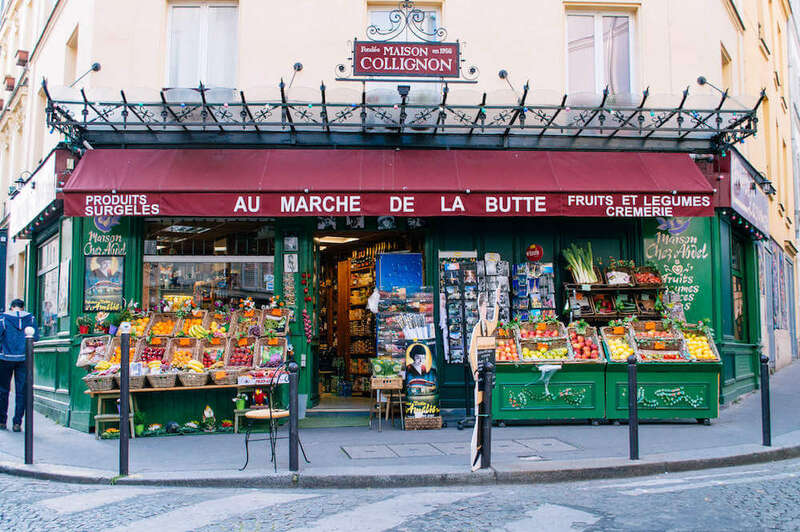 A Wine and Bistro tour through Montmartre: Yes, a food tour through Paris’ most charming neighbourhood with a local guide. Click here to check reviews and availability. 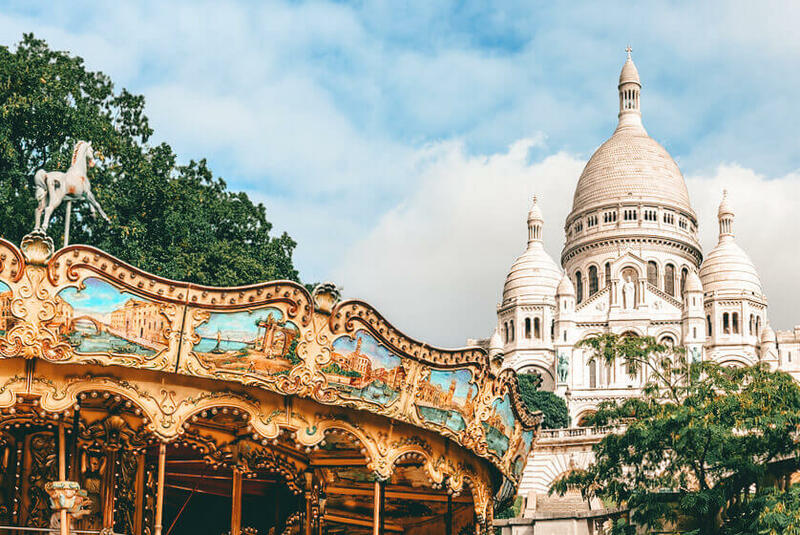 A Hidden Montmartre Cultural Tour: If you’re looking for hidden gems in Montmartre, and your goal is to dig deeper into the culture of this fascinating neighbourhood, this is the tour for you. Click here to check reviews and availability. This is THE most emblematic attraction of Montmartre, and a must-visit spot, in spite of its popularity. 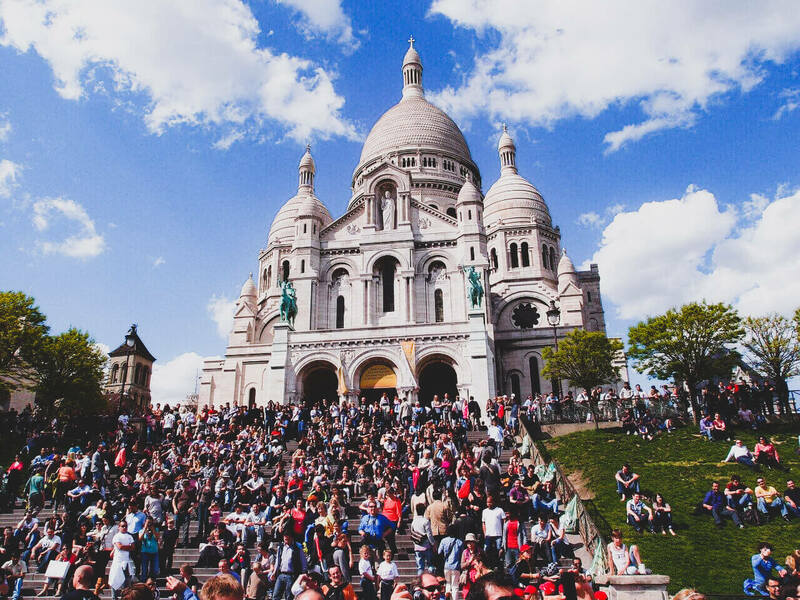 Perched on the highest point in Paris, the Sacré-Coeur Basilica is a stunning white monument that began construction in the late 19th century. Its goal? Be a church that was visible from all over Paris. However, not only is the facade of Sacré-Coeur “pinch-me-gorgeous”, its ceiling is the largest mosaic in France (around 480 m²) and the view from its dome (after climbing 300 gruelling steps) is one of the most stunning views in all of Paris. Did I mention admission is free? Yup! Climb to the top. Seriously, so few people actually climb to the dome of the Sacré-Coeur and I find that baffling. I even remember coming up here on a July afternoon and there was literally no one else there. If you’re able to withstand the 300 steps, I urge you to go! The views are unbelievable, and while the ascent might make you a little huffy and puffy, the serenity from up here makes it more than worth it. NOTE: The entrance for the climb is on the side of Sacré-Coeur – just follow the signs. Watch out for pickpockets and scammers. Again, because this is one of the most popular attractions in Paris, there are a lot of pickpockets, hawkers and overall scammers active in the area. Particularly along the stairs in front of the Sacré-Coeur, be sure to keep a hand on your belongings at all times and avoid the men with friendship bracelets. Often they’ll tie a bracelet on your wrist without consent and then demand you pay for it. Seek out alternate viewpoints. I honestly think the Sacré-Coeur is one of the most beautiful churches in the world, and a perk of that is it’s gorgeous from so many different angles! Most visitors will come and try to snap a shot of Sacré-Coeur from the front, but I don’t actually think this is the best spot to see it. Instead, I prefer just walking around the church like a creeper and exploring alternative angles that way… trust me – the photos are much more interesting and you won’t be surrounded by as many people. My personal favourite of course remains the Square Marcel-Bleustein-Blanchet directly behind the Basilica. Located at the foot of the Sacré-Coeur Basilica, in the Place St-Pierre, this is a sight you’ll likely pass when visiting Montmartre for the first time. And ehhh, sure, while taking the Montmartre carousel for a spin is mostly for kids, it’s worth a look as it’s one of the oldest carousels in Paris. If you do decide to hop on a horse yourself and go for a ride, be sure to look up – the ceiling of the carousel is painted with scenes of Venice, so you can enjoy views of one of the most touristy cities in Europe while within one of the most touristy cities in Europe. Yay! Montmartre is a neighbourhood synonymous with many artistic powerhouses, like Renoir, Van Gogh and Matisse. Most notable of this star studded residents’ list however may be Pablo Picasso, my personal favourite when it comes to the whole “tortured artist” category. 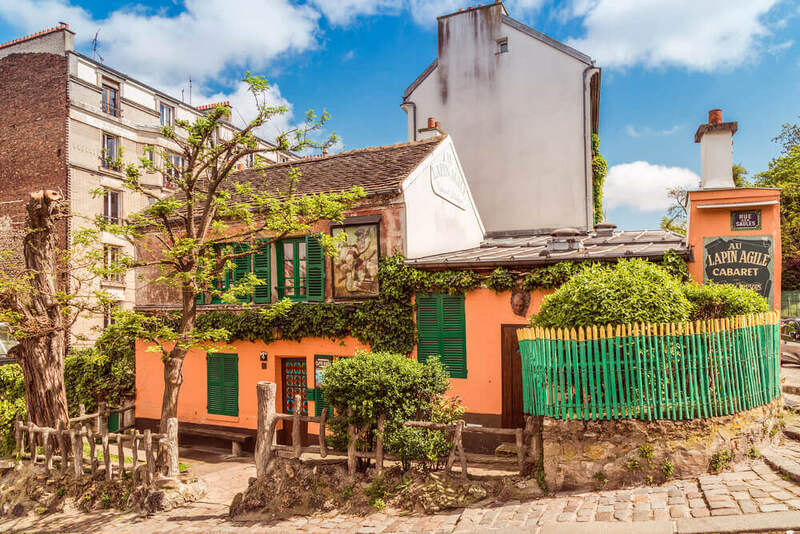 If you’re equally fascinated by the tumultuous life of this Spanish art icon, you’ll want to make some time to explore Montmartre in his footsteps. After all, it was in Montmartre that Picasso co-started the Cubism movement, arguably one of the most famous and influential art movements linked to his name. If you want to explore “Picasso’s Montmartre”, here are some ideas. Picasso’s 1st Atelier: Found on 49 Rue Gabrielle, Picasso’s very first Parisian apartment is a must-visit for any Picasso fanatic. On the 2nd floor is where he lived at the start of the 20th century. 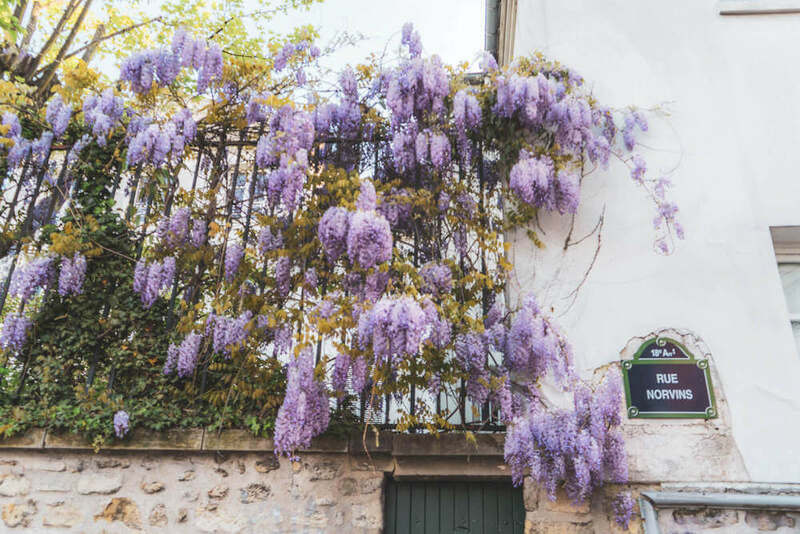 Honestly, you can’t do anything besides take a look at the apartment from the outside, BUT Rue Gabrielle is a very pretty residential street I love strolling through anyway so why not?. Random fact: This apartment was on sale a few years back for a cool 1.5 million euros. Chump change, right? Bateau-Lavoir: To see one of the most famous “artist residences” in Montmartre, head over to 3 Rue de Ravignan. This building was, for years, a residence and meeting place for creatives including Picasso. In fact, this is where he painted his famous Demoiselles d’Avignon. Au Lapin Agile: At 22 Rue des Saules, you’ll find one of the oldest cabarets in Paris, Au Lapin Agile, a favourite of Picasso’s. He even has a painting by the same name. The best part? It’s open to the public even today (although it is definitely a huge tourist hotpsot). 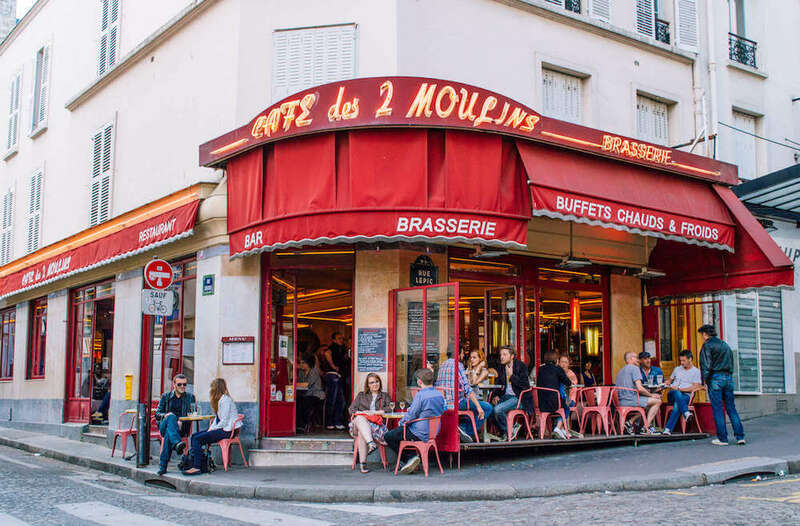 I agree that it’s worth a stop when you’re in Montmartre – it still has a nice ambiance despite the crowds, but don’t spend all your time here, Montmartre has way more to see! Sure it’s cheesy, but when in Montmartre, why not take some time to slow down, people watch and enjoy the ambiance? Square Marcel-Bleustein-Blanchet: This is one of my favourite little spots in Montmartre. While it’s not a big grassy space that you can sprawl on, there are nice benches and an unbeatable view of Sacré-Coeur. If you followed my aggressive tip of watching Amélie before arriving, then you’ll surely want to scope out some of the filming locations of this French classic for yourself. Luckily, many of the film’s most iconic locations are within walking distance of each other in Montmartre. 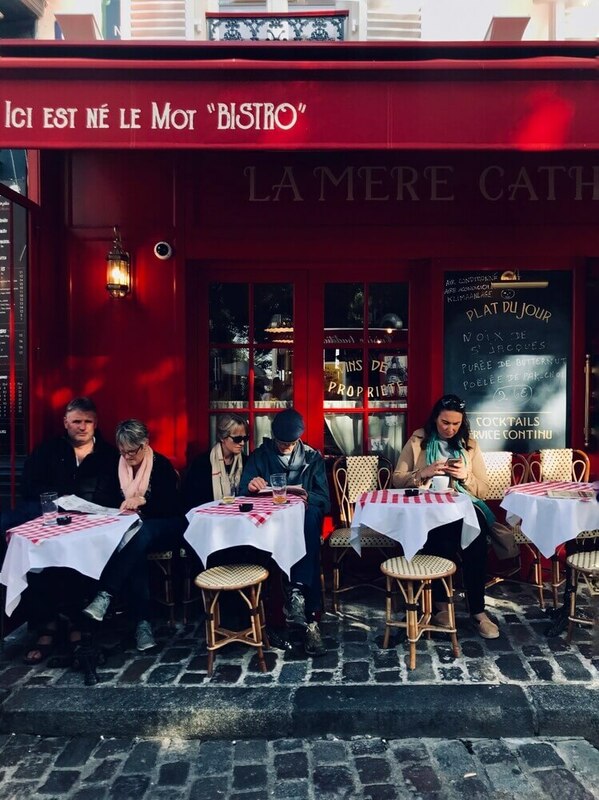 My friend Sophie has put together a full list of locations in Paris you can read here, but here are some spots in Montmartre for you. This is a street that Amélie walks down everyday on her way to work and features in that scene where she helps a blind man “see” the world around him by describing everything as she walks him to the Metro. She drops him off at the Lamarck-Caulaincourt station by the way, a station I love for the double staircase around it. This is the grocer that Amélie visits on a few occasions in the film. I was thrilled to see it looks almost identical to the movie (though beware, it’s literally just a fruit/veggie stand these days, so don’t expect anything overly grand). 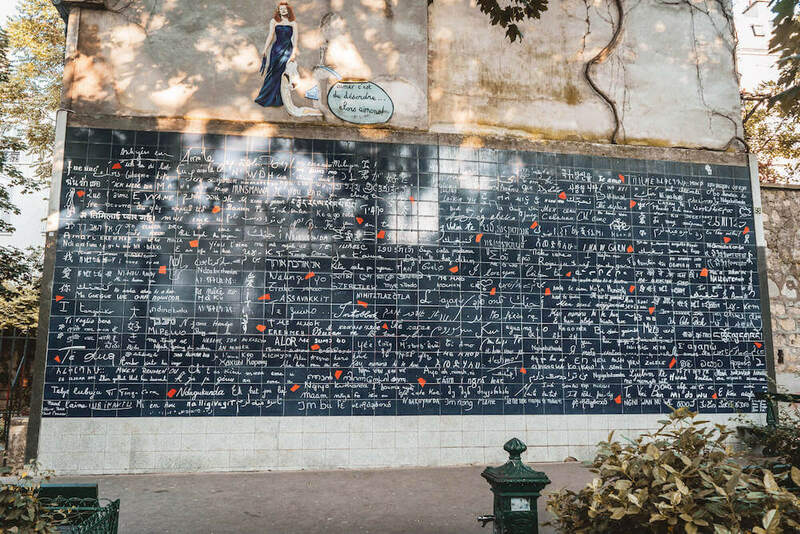 Whether you want a corny photo opp or simply a place to feel aggressively alone, Le Mur des Je t’Aime (AKA the I Love You wall) is one of the most iconic spots you can visit in Montmartre. While it’s cliched and literally just a wall, it’s a huge lovefest spanning 40 square metres with 612 tiles that just scream “I LOVE YOU” in 250+ languages. If you lack a bae’s hand to hold here, I assure you a flaky croissant is just as nice to hold, and infinitely more delicious. It’s hard to deny the impact that Instagram has had on Montmartre over the past few years. 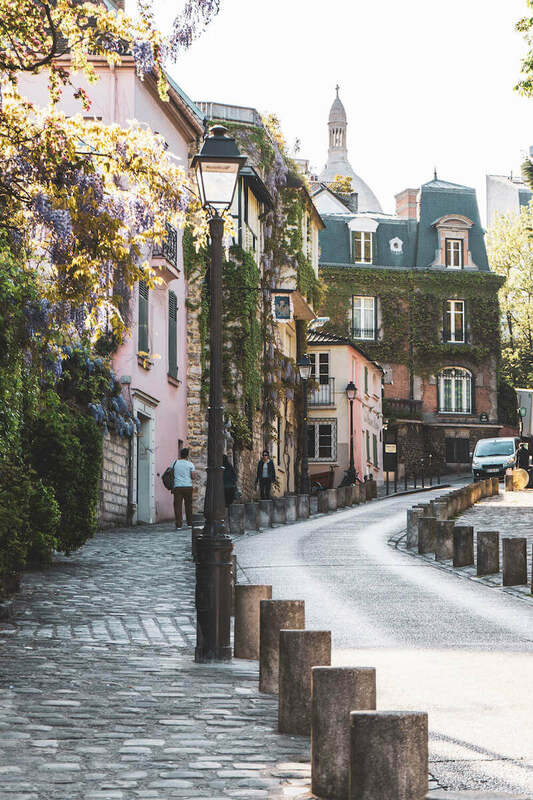 Certainly, this always-photogenic neighbourhood has taken on a whole new level of “iconic” status thanks to the slew of Parisian and international photographers who have chosen the beautiful streets of Montmartre for their photoshoots. And who can blame them? This place is the CUTEST. So, here are a few spots you will have surely seen on Instagram (alongside their addresses). 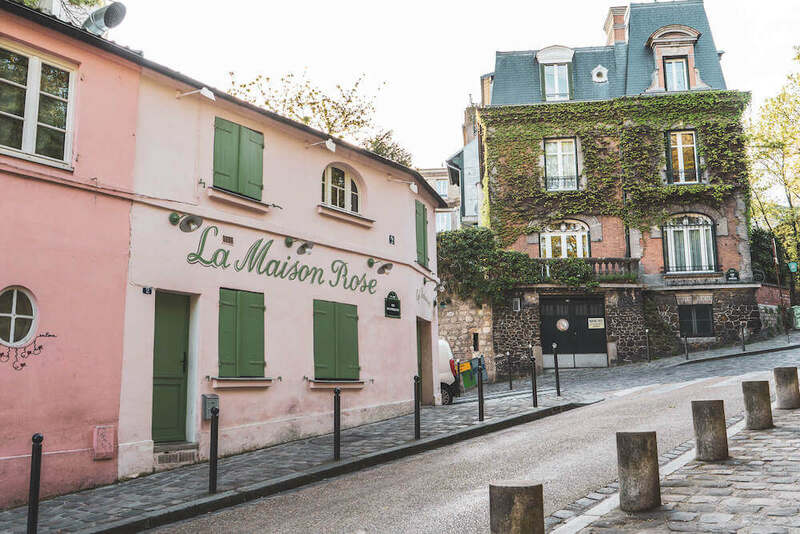 The prettiest pink house in Montmartre, complete with green shutters and wild ivy hanging overhead. A charmingly picture-perfect cafe, with a symmetrical facade and tables spilling out onto the terrasse (when it’s open of course). This place gets busy, so I’d recommend coming early in the morning if you want people-less photos or a sweet people-watching spot for yourself. Okay, so first thing’s first: the whole sinking house thing is an illusion. I’m kind of glad it is, because otherwise WOW what a safety hazard. In any case, here’s how you find the IG-famous “sinking house”. Start off at the front entrance of Sacré-Coeur Basilica (the address provided) and walk down the stairs. Eventually, to your left, you will notice a grassy green hill, with an orange building tucked behind it. This is the sinking building! To get the sinking effect, simply tilt your camera so that the hill lies straight horizontally across your camera screen, then click! It looks like the building is leaning. Yay – magic. PS: You can also book a Montmartre polaroid tour if you prefer physical snapshots! Click here for reviews and more info. Alrighty, if you want to escape the crowds and discover some of the quirkier, lesser known things to do in Montmartre, here are a few ideas for you. In Montmartre you’ll find ivy-clad walls, walls that scream “I LOVE YOU” and my favourite of all, a man stuck inside a wall. As Roobens says, “This random little spot is known as Le Passe-Muraille, the passer-through-walls. 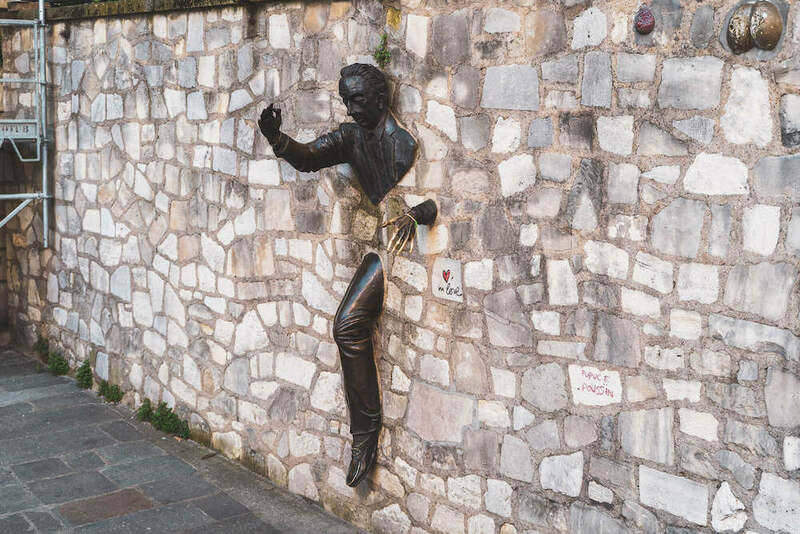 It’s inspired by a book written by Marcel Aymé, “Le Passe Muraille”, about a guy who found out he could walk through walls… ” So here he is – literally walkin’ the walk. You might notice that one of his hands is shiny and gold. Well, that’s because touching his left hand will supposedly transfer his powers to you. I’m no scientist, but I’m not sure that sounds like proper justification to run through walls. That’s just me though. The Montmartre museum scene is one that is often overlooked in the City of Light. After all, with cultural heavyweights like the Louvre and the Orsay in your same city, it’s pretty stiff competition. Nonetheless, if you’re looking to experience the wonders of a Montmartre museum, here are a few options for you. Housed in the oldest building in Montmartre, the Musée de Montmartre is home to an expansive collection of different paintings, posters and drawings that paint a vivid image of Montmartre’s history. 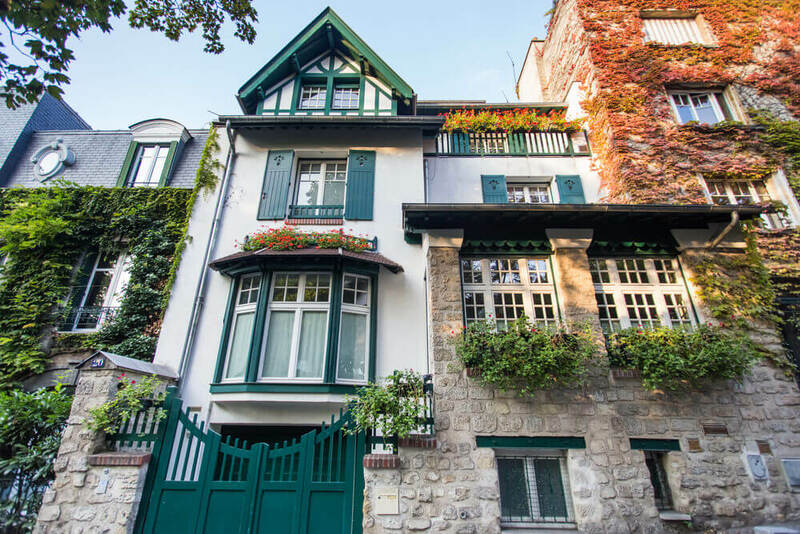 Besides the charming displays, you’ll also find the Renoir Gardens, a little haven amidst the bustle of Montmartre, with an unbeatable view of Montmartre’s secret little vineyard: Clos Montmartre. Long story short, naive art is a type of visual art created by artists lacking the professional training that other “pros” undergo, and the Musée d’Art Naif Max Fourny is a unique museum in Montmartre where you can get your fill of it. Housed in the bright and airy Halle Saint Pierre, this museum has both permanent and temporary collections filled with contemporary naive, folk, and even “outsider” art (not quite sure what that means, but it sounds exciting!) The space is also home to a pretty bookshop and cafe (free to access to the public). Billed as “the only place in France entirely dedicated to Salvador Dalí”, this small, intimate museum is a must for any fans of the Spanish art icon, arguably one of the most well-known artists who ever lived in Montmartre. With over 300 pieces from paintings and sculptures to etchings and furniture, this small, but beautifully curated museum is a Montmartre museum you can’t miss. It can get busy though, so save yourself some stress by getting a mobile ticket in advance here. Once upon a time, Paris had a lot of windmills. Especially in Montmartre, there were dozens of estimated windmills of which only two remain today, not counting the windmill topping the famous Moulin Rouge. Why visit them then? Well, the allure of these windmills is perhaps most enhanced by the way they’ve been immortalized in paintings from the greats, including Van Gogh and Renoir. If you want to catch a glimpse of these relics of the past, you can do so at “Moulin de la Galette” which confusingly refers to two separate windmills AND is the name of a restaurant now. 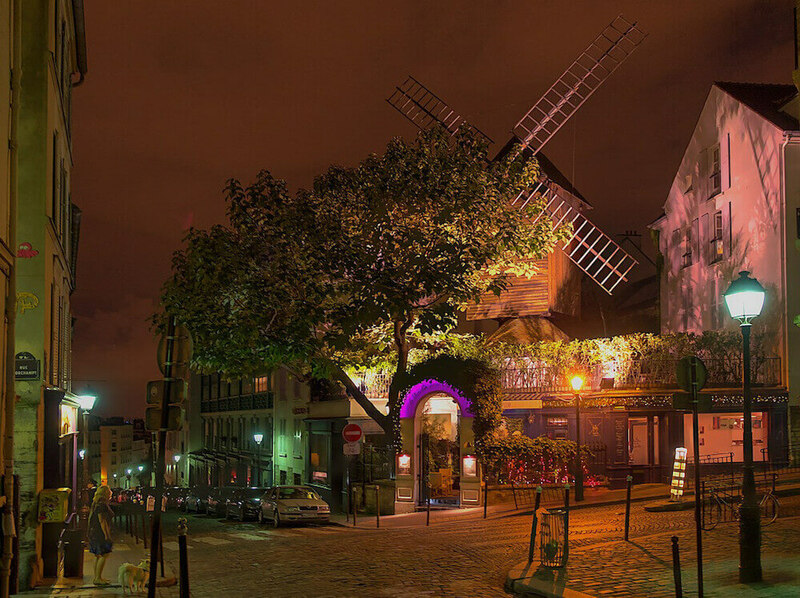 The Moulin de la Galette is comprised of two windmills: Le Moulin Blute-Fin which you can find on the corner of Rue Girardon and Rue Lepic. It’s the only functional windmill today in Paris, but it’s on a private residence and can really only be seen in the winter when the leaves fall off the trees. If you want a cool windmill photo though, a guaranteed shot is you can head to Le Moulin Radet on 83 Rue Lepic (AKA the Moulin de la Galette restaurant). I know, kind of a weird suggestion, but you wanted offbeat things to do in Montmartre… *nervous laughter* right? 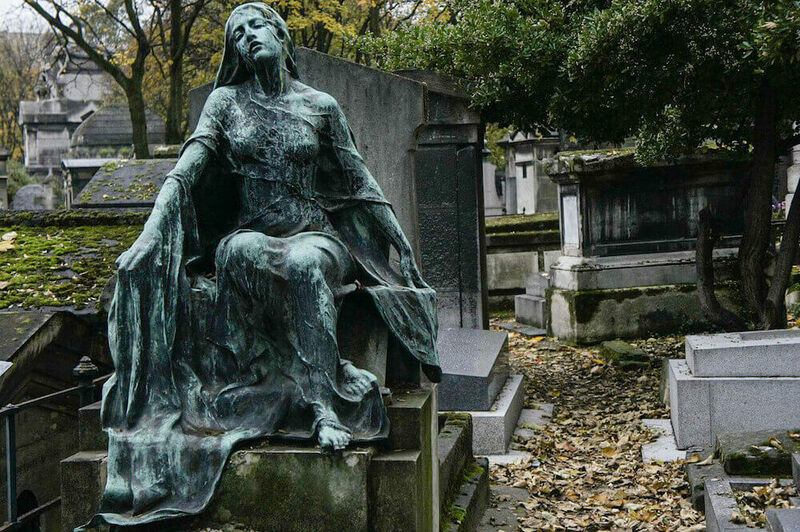 Montmartre Cemetery is a spot often missed by visitors on their visit to Montmartre. BUT as the second largest operational cemetery in Paris, with beautiful graves from a variety of different funerary art styles, it’s worth a visit if you’re looking for a quiet activity. Built into an abandoned quarry and housed under a bridge, this easy-to-miss spot it’s the final resting place of French icons like Dalida. This is a peaceful and quiet escape from the busy workings of Montmartre, and a place to go cat-spotting if you wish – the cemetery is over-run by cats. How to visit: The only way to enter is through an entrance at 20 avenue Rachel, down the stairs just after the bridge. PS: An even lesser known cemetery is the peaceful Cimetière Saint-Vincent, located just down the road from the Maison Rose and Clos Montmartre. Yes, Montmartre has a vineyard of its own, known as Clos Montmartre, and while its quality is…. notoriously not on par with typical French wine excellence, it’s a unique spot that many visitors miss on their visit to Montmartre. I’ve only been able to peek at the vineyard from the outside, but apparently there are tours that you can do which grant you VIP access and a tasting if you’re curious. Click here to check prices and availability. The shiny bust of Dalida is no doubt the starring attraction at Place Dalida, a little square established in 1996 to honour the French musical icon by that same name. A little dark context: Dalida isn’t that well-known outside of Europe, but her life is a sad and fascinating one. As one of the biggest superstars of her time, she enjoyed international stardom with 170+ million albums sold worldwide. But, while she glittered on stage and in the charts, her personal life was wrought with pain and trauma. Throughout her life, all of the following happened: three of her lovers (and a best friend) took their own lives in violent suicides, in 1967, her own attempted suicide left her in a five-day coma, then later that year an abortion gone wrong rendered her infertile. In the end, she committed suicide via sleeping pill overdose in 1987, at the age of 54. Rub them. RUB THEM ALL IN THE NAME OF LOVE. PS: Be sure to look up towards Rue de l’Abreuvoir and catch the gorgeous winding street leading up to the sneak peek of Sacré-Coeur – one of my favourite views in Paris. Last but not least, I leave you with a painfully vague suggestion: carve out an hour in your itinerary to just launch yourself down some of Montmartre’s random little streets. You’ll notice that the tourist bustle is confined primarily to a few key spots, with many of the little streets around Montmartre completely void of people. Sure, many of them are just residential, but you really find a sense of peace and get to soak in the unique atmosphere of this beautiful neighbourhood when wandering alone. Place du Calvaire: A quiet little square steps away from Place du Tertre. La Cour aux Juifs: While a residential courtyard, you can sneak a peek at this stunning spot (one of the most gorgeous courtyards in Paris) at Rue Durantin 40. I haven’t yet had a chance to visit but it’s on my list for next time. You can see some photos of it in this (French) blog post. Allée des Brouillards: This leafy little passageway offers a unique view of the Montmartre Water Tower and Sacré-Coeur and a calm little pocket of oasis away from the crowds. Avenue Juno and Villa Léandre: A lovely little cul de sac with Art Deco houses. A piece of Paris with some English flair. Rue Cortot: A pretty street with big historic houses, super close to La Maison Rose. So as I’m sure you realize by now, Paris is broken up into loads of different neighbourhoods and arondissements which kind of spill into each other. So, while the following activities aren’t technically in Montmartre, they’re really close, and well worth doing. Here are some things to do near Montmartre! Booking last minute? Don’t worry – there are options too! This package for example has rave reviews, includes champagne and has options even for the day-of (as of writing, in January 2019). Click here to check reviews and availability. Okay, keep in mind this is nothing but a photo opp but I think it’s so cool, I couldn’t not include it. 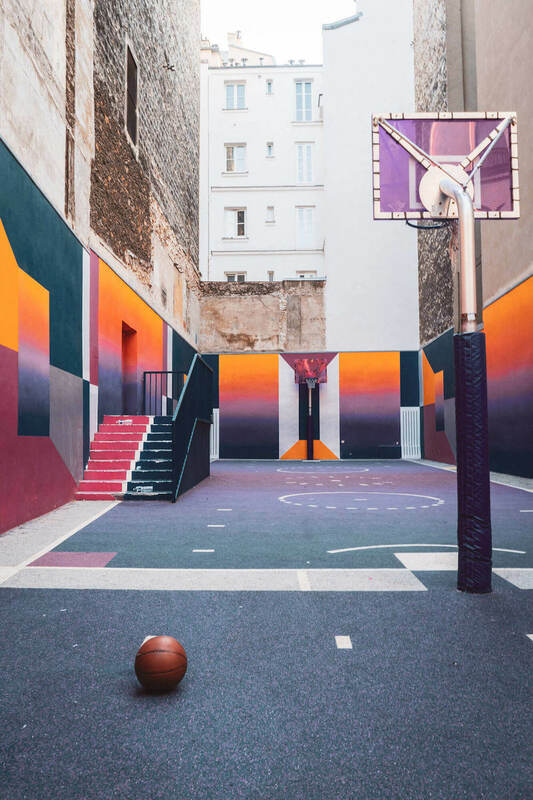 In Pigalle (near Blanche Metro Station), you’ll find a gorgeously painted basketball court. The court is actually operational so if you visit when it’s open, you could potentially hop in for a game, but as for me, I’m happy just admiring the pretty colours from afar. 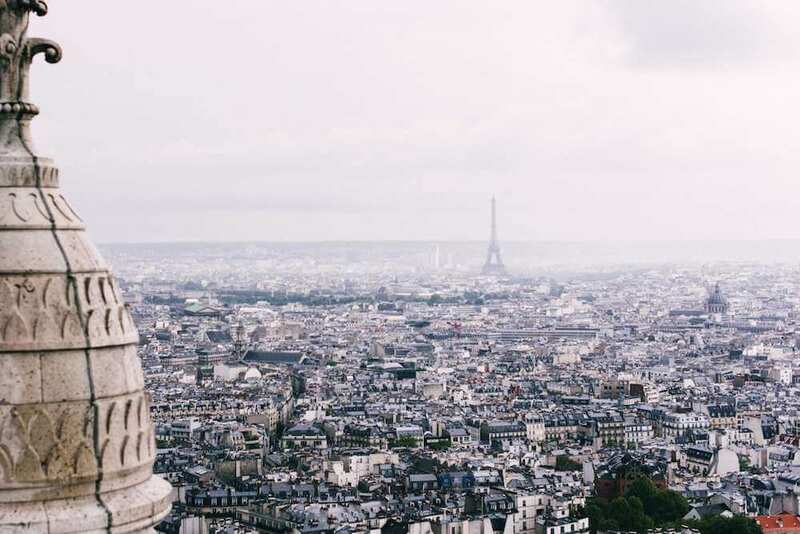 From the dome of Sacré Coeur Basilica: 130 meters above ground, you’ll have one of the best viewpoints over Paris! It’s worth the 300 steps… trust me! From rue Saint-Eleuthere: This gives you a great view of the Eiffel Tower! Don’t miss it! Once you get off the Funiculaire, turn left and walk for like two minutes. You’ll see the Eiffel Tower on your left. NOTE: This is especially nice at night because every hour, from sunset til 1am, the Eiffel Tower glitters. From Rue Norvins: I LOVE this random little spot because it lets you see three awesome things in one go. First, assuming you’re coming from the Sacré-Coeur, walk along Rue Norvins, pass Le Consulat and stop in front of the blue Rue Norvins street sign. From here, you should get a peek of the Eiffel Tower in front of you, some beautiful wisteria behind you (assuming it’s the right season) and the gorgeous Le Consulat to your left. Triple whammy. Square Marcel-Bleustein-Blanchet: This little square behind the Sacré-Coeur is my favourite view of the church. Not only is it blissfully quiet, it’s a nice garden to chill and relax at too. Oof. Honesty, I like it! While Montmartre has definitely grown in “tourist trap” type establishments with medicore food over the past few years, Roobens nonetheless has a few insider recommendations for restaurants in Montmartre that aren’t terrible 😉 Combined with some personal experience and also some tips from local friends, here are a few Montmartre restaurant recommendations for you. Breakfast in Montmartre with a view – can you think of anything more magical? For 25 euros per person, you can enjoy a breakfast buffet with one of the most stunning views over Paris at the Terass” Hotel. The buffet consists of hot items like scrambled eggs and of course classic continental favourites like juices, cereals and pastries. You don’t need to be a hotel guest to eat here, so be sure to take advantage, although an online booking is highly recommended. Click here for more info. A homey little cafe off the tourist trek in Montmartre. Roobens recommended it and I came here for breakfast one morning – it’s a very cute and cozy spot for a light European style breakfast (think bread, coffee and orange juice). A nice place to people watch and watch the world go by. They do serve hot dishes for lunch after 12pm which look amazing too! 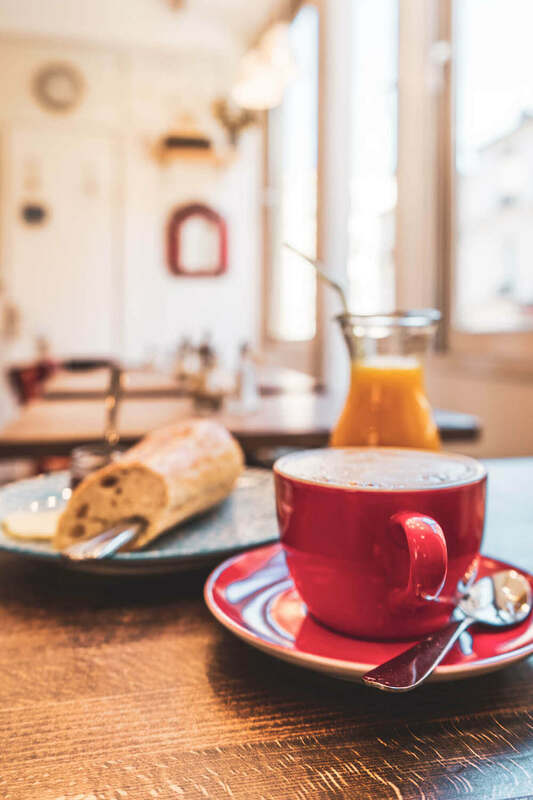 This beloved brunch institution is definitely not a typically Parisian joint, but it’s a perfect spot to grab an Australian style brunch in Paris, with excellent coffee to boot. This might be a great place to fuel up with a heartier, hot breakfast if your usual breakfast croissant isn’t doing the trick. 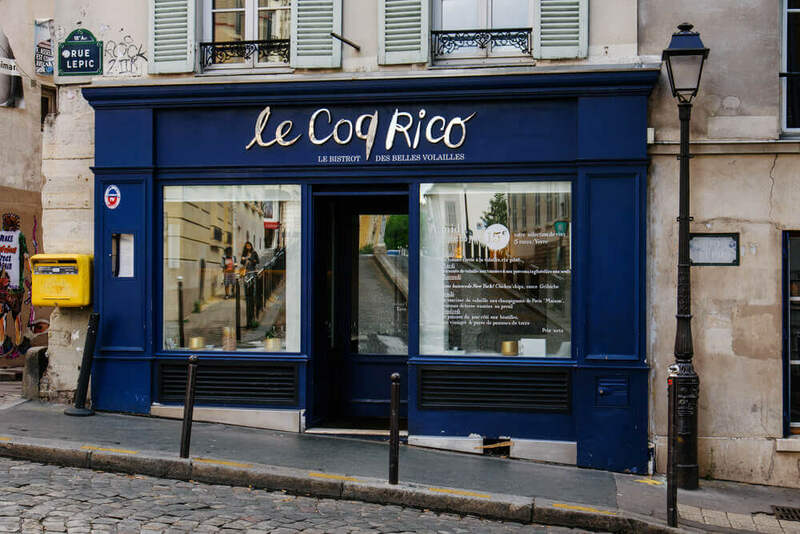 If you’re a fan of poultry, don’t miss this the popular restaurant Le Coq Rico, said to be home to some of the best chicken in Paris. While they’re open for both dinner and lunch, the dinner menu is substantially pricier. Instead, save yourself a few bucks and head for lunch, where you can choose a 15 euro “plat du jour” on weekdays or a 3 course meal for only 27 euros. An authentic little Parisian bistro serving up simple, French food at affordable prices. What more could you want? If it’s a unique and kitschy experience you’re after, Le Refuge des Fondus is here to deliver, with cozy communal seating, pots of hot cheesy fondue and of course, wine served in baby bottles. Apparently you can even draw on the walls…! Weird, but I’m into it. Cozy French food in an intimate (read: tiny!) setting. A great place to sample some delicious French classics. For more information on bookings and prices, visit their website. If you’re looking for an upscale, elegant and special place for dinner, then La Table D’Eugène is a good bet. It’s pricey, but for good reason – it’s a Michelin-starred restaurant serving up elegant bites in multi-course menus. Definitely a splurge, but based on rave reviews, one that is totally worth it! If it’s a cheap drink and a friendly English-friendly atmosphere you’re after, check out this Irish bar next to Le Funiculaire. Open weekdays from 10am to 2am, and until 5am on Friday and Saturday nights. Music, dance floor, alcohol… And lot of expats there! It’s free to get in. Wanting to dance your heart out? 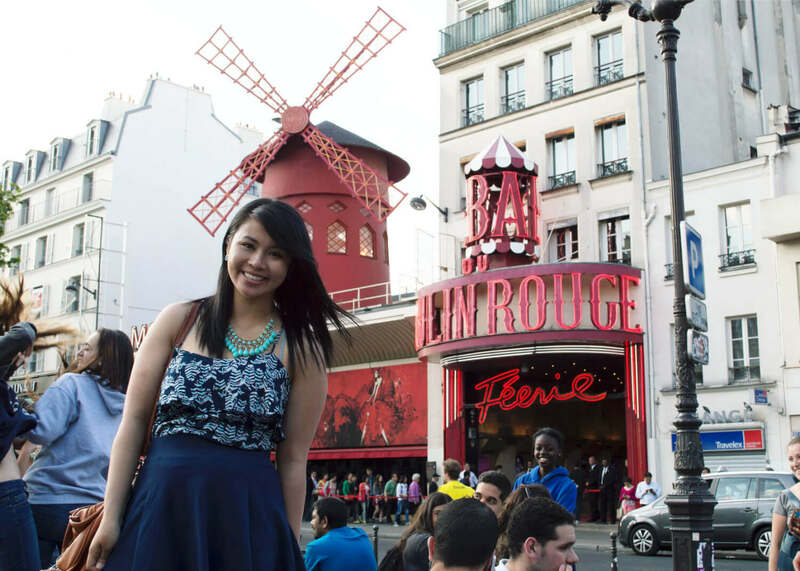 Check out La Machine du Moulin Rouge, a huge club next to… well, the Moulin Rouge! Open Fridays and Saturday nights only from midnight to 6am. You have to pay to get in, usually 15 or 20€. If you’re looking to mingle more with locals than fellow tourists, check out Le Divan du Monde, a theatre-turned concert space which also functions as a (relatively) affordable club. NOTE: There are quite a few stories online about rude security at this spot – so be prepared. A funky little tiki bar serving up cool cocktails. While not officially Montmartre, it’s close, and it’s a local favourite for drinks in a quirky atmosphere. A cheap place to get your drink on, catering mostly to the backpacker/traveller crowd. You can’t beat the prices here! During the Franco-Prussian War, people in Montmartre refused to accept the authority of the French government so decided to form their own system known as La Commune. It lasted three months, but you might sometimes still see references to La Commune around Montmartre, in the form of rebellious graffiti and cute lil bumper stickers. Sneak around the back of the iconic Sacré-Coeur Basilica and the artsiest water tower of all time will present itself. Built out of the same white stone as the Basilica itself, this might be the prettiest water tower in the world… and yes, it still supplies the water in Montmartre! As a historic neighbourhood steeped in legend, often you’ll hear stories about Montmartre that you think can’t possibly true. While highly contentious (and largely debunked by linguists), many say that the word “Bistro” traces its roots back to the Russian occupation of Paris in 1915 when Russian soldiers would scream “hurry up!” or “quick! !” at local cafes, a word that sounded like “bistro”. Whether or not it’s true, a plaque in front of la Mère Catherine peddles this story to visitors starry-eyed enough to gobble it up. I hope you enjoyed that guide to Montmartre, Paris! I know that was a long read, but I wanted to do Montmartre justice. Did I miss any of your favourite things to do in Montmartre? Leave me a comment! And once again thanks to Roobens from Been Around the Globe for helping me put this guide together. To stalk him further, be sure to browse through his black travel blog and also give him some love on Instagram, Twitter and Facebook. Want to save these things to do in Montmartre for later? I know that was a massive post, and unless you have the memory of a brainy dolphin, odds are you might need to save the inspo for later. Well, you can easily do that by hovering over the upper left hand corner of those fancy graphics below to pin them on your favourite Pinterest board. Magic! I haven’t been to Paris in years but this post took me right back. I love Montmartre. There’s so much charm there that at times you don’t feel like you’re in a large city. And, I agree about Sacre Couer. The views are unparalleled with all of Paris at your feet. Best view. Though, I think the best time to go up is at dusk. Great post. This was a gorgeous, detailed, and well-thought guide. Thank you so much. I will visit again and use references from here. I love Montmartre. I started the a couple months ago so I could explore a lot more and it still seems like I missed some things. The Dali gallery was amazing and I love hunting for cool street art. I also had a lovely little wander around the cemetery while there. Great post. I’ll be checking back here in preparation for my next trip to remind me what to look out for. I’m sure it won’t be long before I’m back in my favorite city again. I will be back in Paris in a few weeks. Will def be using this guide to cruise through my fav neighborhood. Thanks ! I’ve been to Paris a few years ago with my mum and went up to Montmartre, as it was one of her favourite spots in Paris back in the day when she lived there (we are talking 40 years ago though). So seeing it jam packed with tourists and no longer the dreamy little artists space she remembered it almost broke her heart. But reading this, I instantly want to go back there with her and try and rediscover the Montmartre she remembers. Thanks for your very long 🙂 but very detailed post. Love this guide! I plan to visit in June and will definitely be saving this for later (because I unfortunately do not have the memory of a dolphin, ha! ).